Worcester Community Action Council’s Head Start program is marking its 25th anniversary in 2017! Join us as we celebrate with a variety of special activities throughout the year and recognize some of the people who have helped shape the program and made such a positive impact on so many children and families. February 2017 marks a milestone for WCAC’s Head Start program – 25 years! 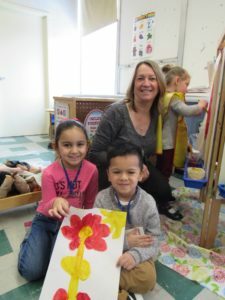 In that time more than 4,000 children have participated in the program which provides both a safe, nurturing learning environment, and developmentally appropriate curricula, health and nutrition services, breakfast, lunch and snack, special education opportunities, as well as family services. While the program has undergone some changes during the last quarter century, one constant has been Evelyn Velez. 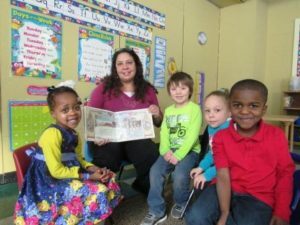 Now Co-Director of the program, Velez began her career with WCAC as a Head Start Family Advocate after coming to the United States from Puerto Rico 25 years ago. The most challenging part of her job? Velez says it’s trying to meet so many regulations and standards from the programs many different funding sources. 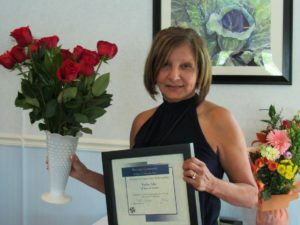 She’s quick to point out, however, the rewarding parts of the job – the many children and families impacted throughout the years, who have become positive role models in the community and are now self-sufficient. As for a favorite memory, Velez says there’s too many to pick from but cites examples where she was able to help a single-mom facing jail time turn her life around, finish her GED and become a working professional; a single dad who secured custody of his three children and didn’t know what to do; another single mom who regularly calls to say thank you for her support in furthering her education, who now works as a case manager for another program in town and regularly collaborates with Head Start to help other families in need; a young man working at Big Bunny Grocery Store who expressed his appreciation for the support he and his mom received from the program, noting that because of Head Start he was heading to college in the fall. As WCAC’s Head Start program celebrates its 25th anniversary this year we’d like to introduce you to some of the people who’ve been involved, nearly since the beginning… meet Melanie – coming up on her 23rd anniversary as a WCAC Head Start teacher, she first became acquainted with the program when she enrolled her son. 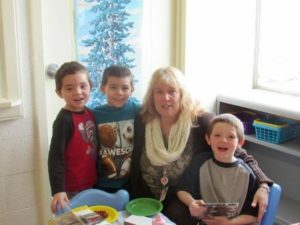 A parent volunteer for several years, she eventually took a position as a teacher the year her son enrolled in Kindergarten. Thank you for your remarkable 23 years (almost!) of service to our Head Start children and families, Melanie! 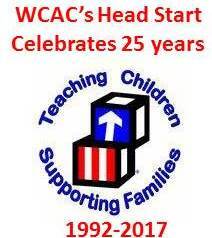 As part of WCAC’s Head Start 25th anniversary, U.S. 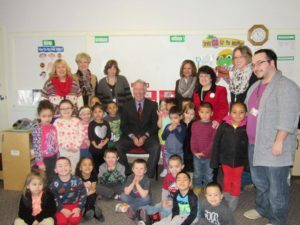 Congressman Richard Neal visited the program on February 10, 2017. He made time to read a story with a classroom, meet with Head Start parents and staff, and reiterated his strong support for the Head Start program. See more pictures from his visit here. Click here for video coverage of Congressman Neal’s visit as captured by Charter TV3 News. Click here for new coverage of the visit by the Worcester Telegram & Gazette. As WCAC’s Head Start program celebrates its 25th anniversary this year we’d like to introduce you to some of the people who’ve been involved, nearly since the beginning… meet Yvette – a WCAC Head Start teacher for 21 years, she first began her career with WCAC as an education coordinator for a Pregnant and Parenting program. The most significant change during her years with the program has been its tremendous growth. A special (but not favorite) memory was when the agency’s site at the Woodward Building in Oxford closed (emergency evacuation due to snow!) – all the teachers came together for a farewell picture in front of the building… I realized that we were not just co-workers, we were family. Thank you for your remarkable 21 years of service to our Head Start children and families, Yvette! As WCAC’s Head Start program celebrates its 25th anniversary this year we’d like to introduce you to some of the people who’ve been involved, nearly since the beginning… meet Carmen – she first became aware of the Head Start program back in 1990 when her niece was enrolled. At the beginning all of the classrooms were half-days with bus transportation provided for all. Her favorite memories include doing center activities and parent engagement – seeing the progress on all children through the year and the parent’s satisfaction when they see their children’t progress. Thank you for your remarkable 21 years of service to our Head Start children and families, Carmen! 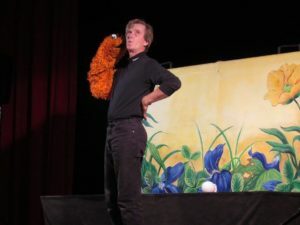 As part of its ongoing 25th anniversary celebration, WCAC was pleased to welcome the Pumpernickel Puppets to the program for a free, family-friendly performance on Thursday, March 23, 2017. We are most grateful to the Southbridge Cultural Council and Massachusetts Cultural Council for providing the funds to bring this amazing talent to our center to share with over 200 of our children and their families! The children enjoyed two stories – The Lion & The Mouse and Three Billy Goats Gruff… while getting the chance to get up close and personal with several of the puppets! View additional photos from the performance here. WCAC’s Head Start program celebrated its annual Multicultural Night on April 27th with arts & crafts and food samples based on 14 different countries! 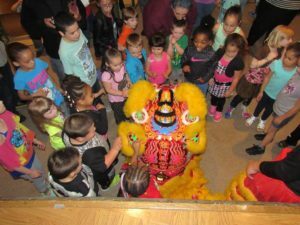 A highlight of the festivities included a performance by the WYND Lion Dancers from the Southeast Asian Coalition, sponsored by the Southbridge Cultural Council as part of the program’s 25th anniversary. Following the dance, children were able to get up close to the dancers, try on the costumes and even bang the drum! See pictures from the event here. One May 23rd, local families enjoyed the third of three planned special cultural performances as part of WCAC Head Start’s 25th anniversary with a performance of The Fairy Circus by the Tanglewood Marionettes yesterday. 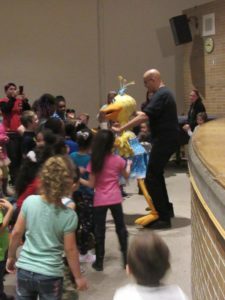 The event was sponsored in part by a grant from the Southbridge Cultural Council, a local agency, supported by the Massachusetts Cultural Council, a state agency. See more pictures from the event here. On May 25, 2017, WCAC celebrated its 12th Annual Action hero Awards. 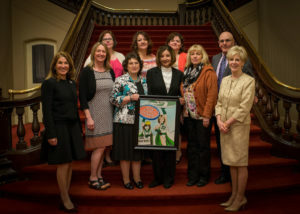 Our own Head Start program was awarded one of the coveted honors, celebrating its 25 years of service to the southern Worcester County area. Co-Directors Kathy Dow and Evelyn Velez were honored with one of the agency’s infamous Action Hero caricatures. See more pictures from the event here.